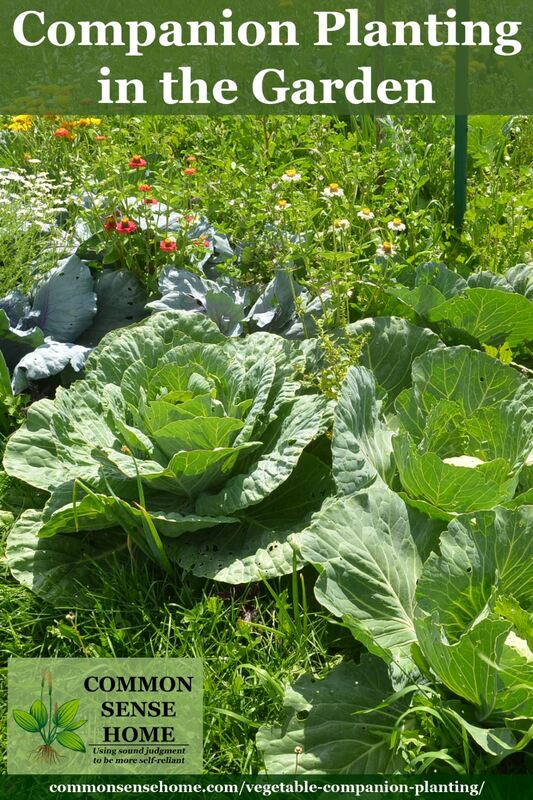 Fruit and vegetable companion planting takes advantage of the natural likes and dislike of plants to create a thriving, more diverse garden ecosystem. I loosely adapt the concepts presented in the book “Great Garden Companions” by Sally Jean Cunningham– the more you research, the more likely you are to find resources that contradict each other. This is not an exact science. Another very commonly referenced companion planting resource is Carrots Love Tomatoes by Louise Riotte, and its companion book for flowers, “Roses Love Garlic“. What I really like about Sally Jean's system is that she groups plants into “garden neighborhoods”, which contain “families” of plants that grow well together, and “friends” that support these families. You can mix and match within the family and friends list for a neighborhood to find a companion combination that works for your garden and the crops you want to grown. Because all the plants in a a neighborhood have similar growing needs, the entire neighborhood can be rotated around the garden. The friends plants often support beneficial insects and/or help repel problem insects. In this post I'll discuss Sally Jean's six neighborhoods and how I work with companion plants in my garden. Potatoes are also in the same botanical family as tomatoes, but because of their very different growth habit, they're placed in a separate companion group. Sally Jean suggests planting lettuce, spinach and other greens around the outside of the bed at the beginning of the season for an early harvest. As the tomato family plants grown and bush out, the last of the greens can be cleared to give them more room. Sally Jean likes to alternative a row of potatoes with a row or peas or beans to deter potato beetles and Mexican bean beetles. Potatoes are good for breaking up new beds because of all the digging required. I do put potatoes and beans in the same bed, but I don't alternate the rows, because I don't have significant problems with either of those pests. I also prefer growing pole beans, which require frequent picking from first ripening until frost because they are so productive. 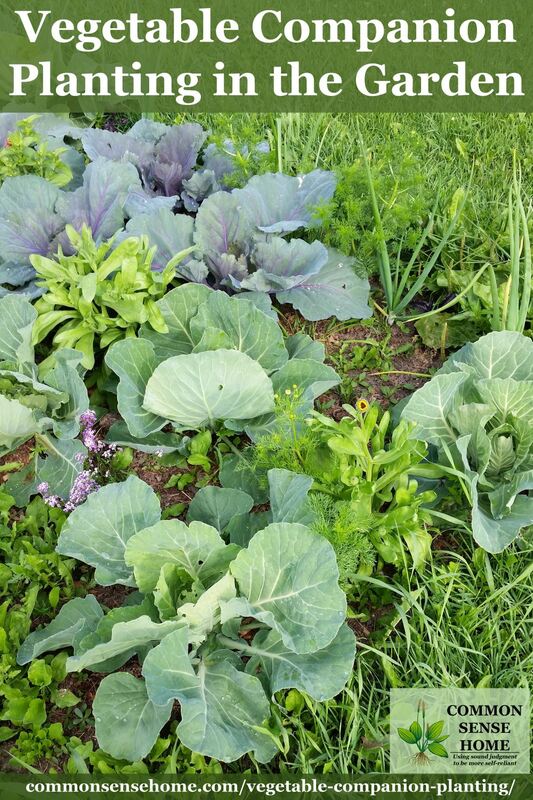 Sally Jean likes to plant her cabbage family crop in a 2-1-2 or 3-2-3 grid pattern in the bed with groundcover or root veggies such as onions, carrots or beets in between. For example, in a wide row, you might plant 2 cabbage plants, then 1 cabbage plant, then 2 cabbage plants and so on down the row. Lettuce can do well in the shade of taller broccoli or Brussels sprouts if the soil is rich enough. Melons can also be included with this group. I have found that planting sweet corn and pole beans together did not work well in my northern garden. The corn was crushed by the beans before it could get well established. Similarly, planting the corn and squash together led to the squash strangling the corn. What did work well for me was to plant the squash in hills placed at intervals around the corn patch, and allowing some vines to trail into the patch once the corn was established. This seems to help keep the raccoons at bay. In a traditional Three Sisters planting, the corn and beans are both drying types harvested at the end of the season, so you don't need to get into harvest during the growing season. You may be able to get multiple sowings of greens and roots during the course of the season, depending on the varieties used (check time to maturity). I've shied away from using Queen Anne's Lace and Caraway near my carrots, as the plants are so closely related. This is an area where Sally Jean and I will have to agree to disagree. While she suggests pairing up aggressive growers such as horseradish and tansy, which might not be a bad idea, there's no way I'd put horseradish, tansy or yarrow anywhere near my strawberries or asparagus on purpose because they spread like wildfire. I've grown all but a few of the others with no issues, but those three can take over a garden in record time. Proceed with caution. I don't use only the plants listed in each family in a specific garden neighborhood. We love onions (I plant hundreds), so those get tucked all over in the garden. I know in theory that they'll not supposed to be planted near peas and beans, but sometimes we do (to help keep the rabbits at bay) and I haven't noticed a problem. I also love the look of sweet alyssum and lobelia, and grow a couple flats of them (over 100 plants) each year from seed. They do well in my garden, and the little pollinators love them, even though they aren't featured prominently on the lists. They are low growing, and can be tucked just about anywhere as a ground cover. I tuck different culinary herbs all over the garden, too. Yarrow can enhance the flavor and scent of some other plants, so I like to work with the herbs and the yarrow together. Most people don't think about weeds as companion plants, but purslane makes a good ground cover, as does white Dutch clover. Clover also adds nitrogen to the soil, so it is particularly good paired with heavy feeding crops like corn or cabbage family plants. You can read the post, “5 Reasons I Want Weeds in my Garden” to learn more about the use of weeds as ground covers, for soil building and for attracting beneficial insects. Nasturtiums always have a place in my melon patch, and volunteer cosmos and chamomile pop up all over the garden. I thin them as needed – the bees and butterflies enjoy them all. Think about providing blossoms from the last spring frost until after fall frost to keep the bees fed. Experiment, and find out what works for your growing conditions. I always try to strike a balance between keeping a crop concentrated enough for easy picking, and growing other crops mixed in to alleviate pest pressure. Think about growth habits – use tall plants to shade shorter ones that can't stand the heat – or plant the tall plants to the north to make sure the rest of your garden gets more sun if needed. Use plants as a living mulch – just don't plant them so thickly that they are overcrowded. It's amazing how much growth takes place in a single season. If you don't have a good feeling for how much space a crop will need, invest in a good book with spacing requirements such as Square Foot Gardening or The Vegetable Gardener's Bible. Your garden is a living canvas, and I invite you to paint it with a variety of wonderful tastes, smells, colors and textures. 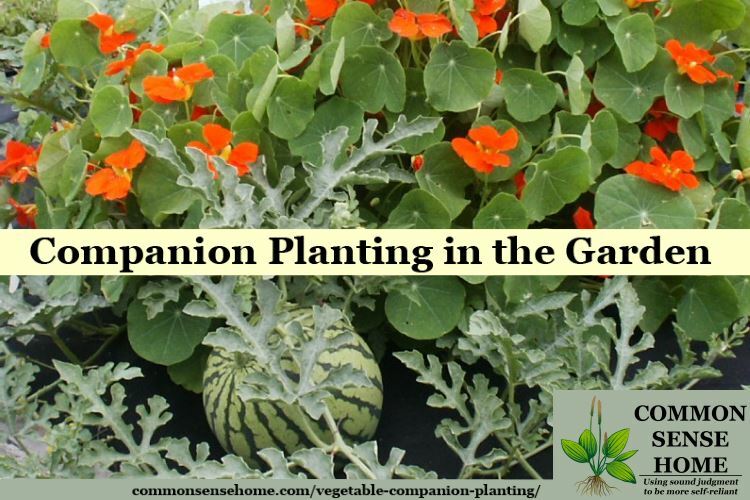 What are your favorite companion planting combinations? I'd love to hear suggestions, from those in similar growing conditions and those in very different growing conditions. It's always great to learn from each other. Thank you for this extensive post. 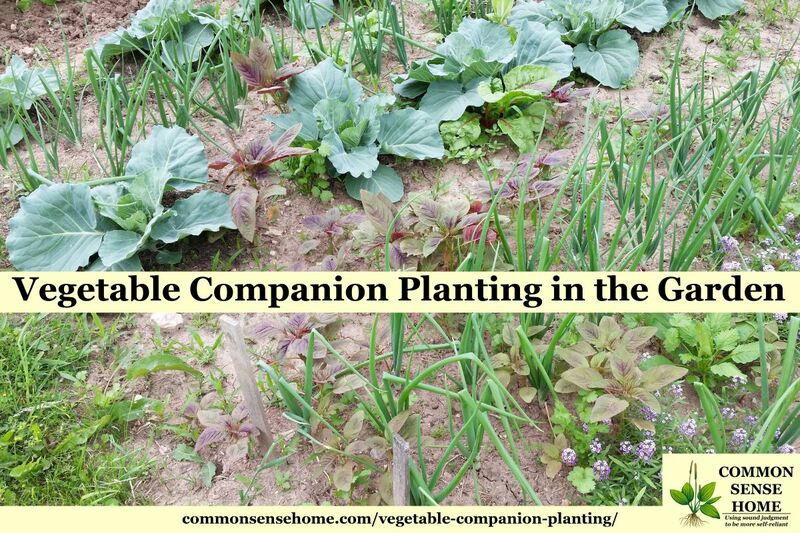 I have tried companion planting. Not sure how much success I got, because we are still working on turning out clay ground into better garden ground. And I haven’t found anything that deters fire ants yet. But I keep trying, so thank you! I will look for that book when I get a little extra money. I am going to bookmark your post so you get the credit. we are up in the NorthEast –adirondack mountains, zone 4. I love nasturtiums in the squash—great color and textures. I also plant and replant marigolds everywhere, the single ones are my fave, the ones that get nice and bushy and no taller than 10-12″ or so. They look wonderful around everything, and smell divine. My cilantro and dill self-seed through out as well, and this is a nice delicate look among heavy leaved things like kale and B sprouts. Its fun to see so many companion plants on your lists that re-emerge each year in my up north zone 3 garden. The good companions that self-seed are wild asters, ox eyed daisies, yarrow, common and Chinese plantain and self-heal. Of course we variously appreciate dandelions, both wild and Italian, burdock, salsify, nettles and thistles of various kinds. The only welcome self seeding companion that I have introduced is borage, my big bee buddy. There are some less welcome plants that self seed. It was so disappointing to discover that my lovely, tenacious buttercups were deathly poisonous. They have become an ongoing opportunity for becoming more skilled at invasives management. I hope that others eventually report ways to recruit these guys to play with us in our gardens. I planted borage once – it’s come back every year since. The bees love it, and it’s easy to pull where I need room. Marigolds and zinnias are my favorites to add to the garden, whether ‘yard’ gardening or container gardening. I love those, too, and so do the butterflies, especially the zinnias. Can hollyhocks be grown with lettuce? Or which vegetables? I’d use them on the north side of a bed, unless you need them for shade for plants that don’t like too much heat, like lettuce.